The Place Mention the best Tonkatsu in Tokyo and Maisen is the first restaurant to come to my mind. I surprised myself by choosing to forsake Maisen on my last Tokyo trip to try another well-known Tonkatsu institution, Tonki. Located in Meguro, Tonki has been around for a long time, 77 years to be exact since 1939. I arrived minutes after its opening hour at 4pm on a weekday, and was greeted by a full house scene beyond the wooden sliding door at its entrance. My first impression was the spaciousness of the setting. I have seen many counter seats in restaurants, but this sight is probably the biggest counter seat setting around the kitchen I have come across. With an open concept and a three sides elongated seating setting, everyone seems to be here to watch a culinary performance after purchasing their meal ticket. It was full when I arrived, and I was gestured to level two of the restaurant, which I politely refused and expressed my interest in waiting for a table at level one. Ultimately, it was one of the highlights of dining at Tonki for me, to be able to watch the chefs in action. The Food Our orders were taken before we got a table, and it wasn’t tough making a choice here since it is mainly between the rōsu (fatty pork) or hire (lean) cuts. Unlike Maisen or Butagami, you do not get to choose your pork from specific regions at Tonki. I also noticed that every chef specialises in a specific step – coating the pork with generous batter and breadcrumbs, deep frying and the eventual cutting into bite-size slices. Served with rice, soup and shredded cabbage, the dark brown skin of the Tonkatsu was extremely crispy, while the meat is succulent and tasty on its own even without any accompanying sauce. I tried both the fatty and lean cuts, but I found the difference to be minimal in terms of the juiciness and flavour of the pork. Rants You will smell like oil after dining here, be prepared. Will I Return Again? I love the experience of Tonki as it managed to retain this old-school rustic charm after all these years. 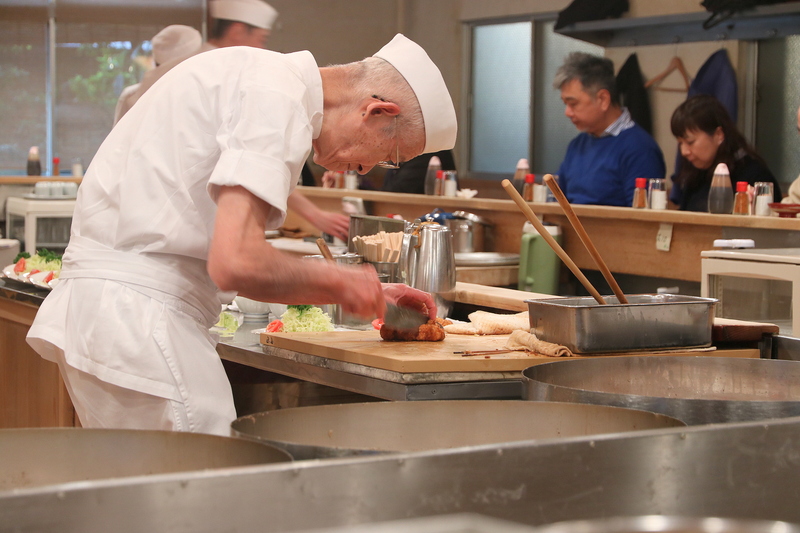 Afterall, how many restaurants can survive more than 50 years in Tokyo? As for the million dollar question if it is better than Maisen, it is subjective but my preference is still Maisen as I found its Tonkatsu much more juicy and rich in flavour.